﻿ [Glossary] 10 Email Marketing Terms You Need to Know to Improve Your Results » Red Mango Marketing! Congrats! You’ve sent your email campaign to your list of contacts. Now you can sit back and watch the orders pour in, right? Just because you got your message out, doesn’t mean that you can just kick back and relax just yet. It’s time to look at your reports so you can evaluate how your email did and take note of where you can make improvements. But first, you need a strong grasp on the key reporting terms — what they mean and how they impact your business. That’s why we created this glossary, for a quick reference of the key reporting terms you need to know. 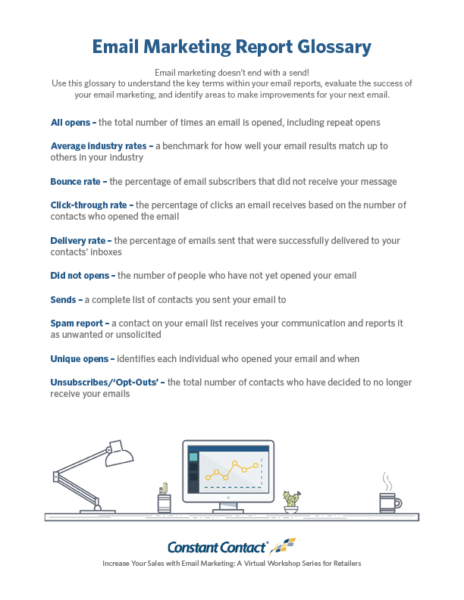 Print this glossary so you can have it by your side the next time you dive into your email reports. We’ll show you how to use these terms and measure the impact of email marketing on your business during our next free virtual workshop. Sign up to reserve your spot now. Even if you can’t join us live, sign up and we’ll send you a free recording. In the meantime, leave us a comment and let us know your biggest reporting challenges. 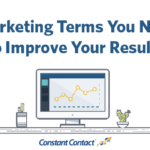 The post [Glossary] 10 Email Marketing Terms You Need to Know to Improve Your Results appeared first on Constant Contact Blogs. This entry was posted on Monday, April 25th, 2016 at 12:00 pm	and is filed under Email Marketing, News & Updates, virtual workshop for retailers. You can follow any responses to this entry through the RSS 2.0 feed. Both comments and pings are currently closed.